Everyone claims high quality, but the only way any manufacturer can really quantify manufacturing quality, is by thorough tests that verify every part in your BOM is correct, meets specifications and is correctly assembled. “Functional” test setups provided by OEMs are typically custom “Hot Mockups” that only check basic functionality. Hot Mockups may find gross defects, but pinpointing the majority of defects can cost 10 to 100 times more than using commercial A.T.E. 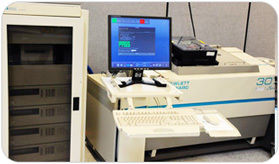 (Automated Test Equipment) designed for the specific task. Take a very common fault: shorts. Shorts are almost impossible to pinpoint with Functional Test, can blow up the board and even the tester. 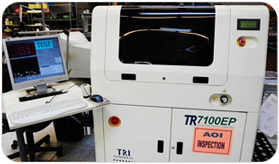 Our 3070 In-Circuit Tester will identify shorts and a myriad of other manufacturing and component defects in seconds. Hence, UMAI has invested in ATE from the leading vendors, covering every type of test. As well as all complementary services from start to finish. Thorough DFT (Design For Test) analyses upfront, so you can fix problems in your design and ensure your products can be thoroughly tested. Local on-site kit audit. Quick check that the kits have all the parts and all part IDs are correct. AOI (Automated Optical Inspection). The least expensive way to find many process errors such as missing part or opens, before soldering. (We also do visual inspection at all stages). X-Ray inspection. Checks the quality of solder joints. Particularly useful for BGA rework and process tuning. ICT (In-Circuit Test). 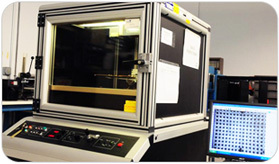 Our Agilent 3070 is the most thorough test of shorts, opens, solder joints and that every part is inserted, is correct and meets specifications. Functional Test. Ensures your product as a whole performs to specifications. Burn-in. Eliminates infantile mortality, DOA’s in the field, and ensures long-term product reliability. Failure and root cause analysis. Tunes your design and our process to improve process yields. Staff of experts from Agilent/HP, Teradyne/GenRad with decades of experience, post-graduate degrees and many awards. Consulting services and educational seminars for your engineers and management. Developed hundreds of fixtures and programs for ICT, Boundary Scan (JTAG) and Functional Test. 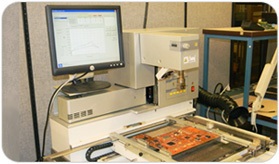 Including for some of the largest and most complex PCBAs in the industry. Special techniques to overcome problems such as ultra fine pitch and limited or no-access. Special techniques for NPI and specialized markets like medical and HMLV. Expert on-site support second to none. Support and portability at any CM/EMS worldwide. You are never locked in.